Rail passenger service has returned to Northern Manitoba after a 2-year absence and you will want to join us as we travel roundtrip from Winnipeg to Churchill by rail. Those on the tour will get to access the train’s domed observation car to enjoy the scenery along the route and experience the amazing heritage and wildlife of Northern Manitoba. This 7-day, 6-night tour features sleeping accommodations on the train (2 nights each way), 3 full days and 2 nights hotel stay in Churchill, town and Hudson Bay shoreline tours, beluga whale watching & Fort Prince of Wales tour; Parks Canada Interpretive Centre (located in Churchill’s restored train station) presentation, the Itsanitaq Museum’s renowned collection of Inuit art, Cape Merry Historic Site and additional heritage experiences. Package includes hotel stays, rail trips, transfers, heritage attractions and presentations, most meals, tour director, detailed tour info kit and more. Price: $ 2,795.00 CDN + GST per person in Train Section or $3,295.00 + GST in a Train Cabin (per person based on double occupancy). Single supplement $500.00. We also have limited space to travel roundtrip by train (2 nights in total) from Winnipeg to Gillam, Manitoba (for a 2-night hotel stay) and day trip by boat on the Nelson and Hayes Rivers and Hudson Bay to historic York Factory. Taking place from Tuesday September 3 to Saturday September 07, 2019 for $ 3,695.00 CDN in a Train Room + GST (per person based on double occupancy). Single supplement $500.00. 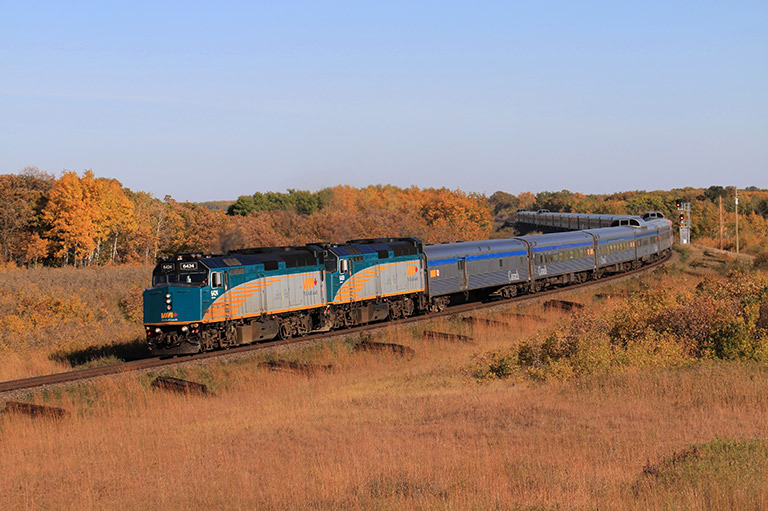 NEW schedule for 2019 features the return of daylight train travel on the first day of this popular 5-day, 4-night fall colours tour from Toronto to Sudbury, Ontario on VIA Rail’s domed car train The Canadian for some great fall foliage viewing through the Muskoka region. Roundtrip from Toronto, this package also features all daylight travel with hotel stays each night (4 in total), 2 full travel days on VIA Rail’s Sudbury to White River remote rail service or Rail Diesel Car (like a large bus on the rails and the last of its kind in Ontario!) to see some pristine parts of the Canadian Shield in the fall. The package also includes visits to Dynamic Earth (for presentations about the heritage and topography of the region), Northern Ontario Railway Museum, White River Museum, and experience “A Bear named Winnie” presentation in White River where this now famous bear cub was first adopted. The final day will be travelling from Sudbury back to Toronto by motor coach providing the opportunity to stop and tour the former CPR steamship the SS Keewatin in Port McNicoll. Package also includes most meals and additional heritage presentations, tour director, detailed tour info kit and more. $1,195.00 CDN +HST (per person). Single supplement $400.00. When you book this trip Canada’s History Society receives a commission which goes to support our educational and outreach programs. Reserve your spot today or ask for more information how you can ride the rails of history! Call Rail Travel Tours toll-free at 1.866.704.3528 to process your deposit and reserve your space, and for more information on how you can ride the rails of history.